When everything should circle around Apoc I decided to do something else. Why not the high elves from the starting box? It's a cheap way to start a fantasy army. But the biggest reason I like them is that it's so totally different from anything and everything else I've earlier done. I felt that it would be fun to try some new colours, so why not orange and gold. I think the shields will be brown with white detailing but I haven't decided yet about the dragons on the shields. 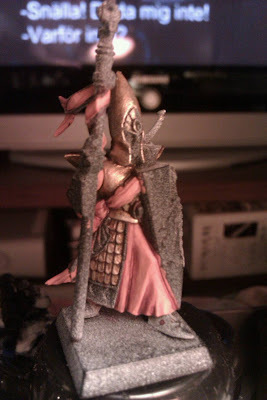 I like lizard green dragons but are a bit afraid about bringing to many colours on the mini. This is no pride festival! I'm very fond of contrast colours, but in this case I'm a bit worried there will be to many. Tonight I will paint two versions and pic the best one.